Democrats Release Green New Deal. Here's What's in It. Democrats Release Green New Deal. Here’s What’s in It. New York Rep. Alexandria Ocasio-Cortez released a resolution that outlines the “Green New Deal” that’s become a central part of the Democratic agenda. Ocasio-Cortez’s nonbinding resolution calls for a variety of social justice and welfare state goals, including “a family-sustaining wage, adequate family and medical leave, paid vacations and retirement security,” and “high-quality health care” benefits for Americans. The call to “promote justice and equity” among those groups is seen as one of the Green New Deal’s primary goals by its architects. The House resolution has more than 20 co-sponsors, according to a fact sheet also obtained by NPR. 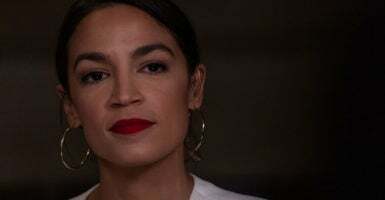 “[I]n 10 years, we’re trying to go carbon-neutral,” Ocasio-Cortez told NPR Thursday on why the Green New Deal called for aggressively reducing emissions. However, the resolution, and any legislation stemming from it, has zero chance of passing out of Congress or being signed into law by President Donald Trump. Conservative groups, and even some Democrats, see the Green New Deal as a grab bag of unrealistic socialist dreams. “A six-page, nonbinding resolution marketed as a ‘War Plan’ proves Congressman [Ocasio-Cortez] isn’t prepared and hasn’t done her homework,” Dan Kish, distinguished senior fellow at the Institute for Energy Research, told The Daily Caller News Foundation. “Running the world’s greatest economy on unicorn farts and rainbow stew all run by masterminds in Washington, D.C., is a fool’s errand,” Kish said. Democratic Massachusetts Sen. Ed Markey will be releasing companion legislation in the Senate Thursday, which reportedly includes Democratic Sen. Cory Booker of New Jersey and Sen. Kirsten Gillibrand of New York as co-sponsors. “Even the solutions that we have considered big and bold are nowhere near the scale of the actual problem that climate change presents to us,” Ocasio-Cortez told NPR in an interview. “It could be part of a larger solution, but no one has actually scoped out what that larger solution would entail. And so that’s really what we’re trying to accomplish with the Green New Deal,” Ocasio-Cortez said.